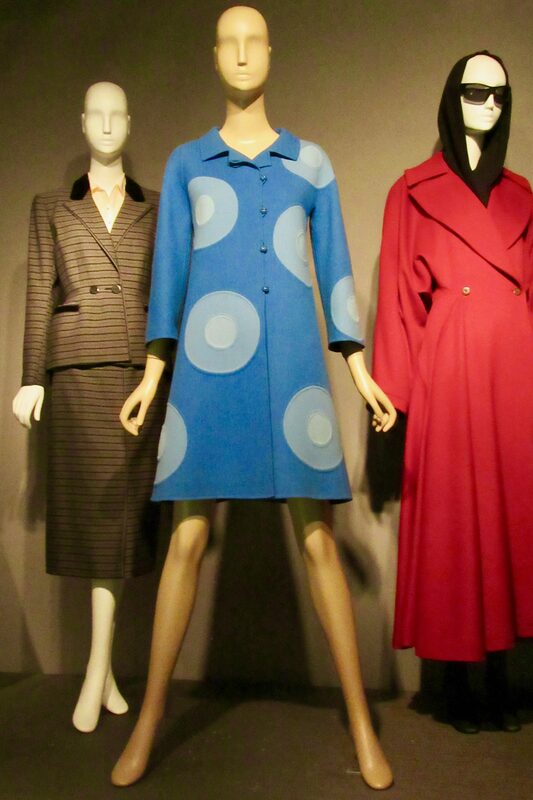 By the 20th century, wool suits and coats were indispensable, practical elements of fashionable daywear for women. 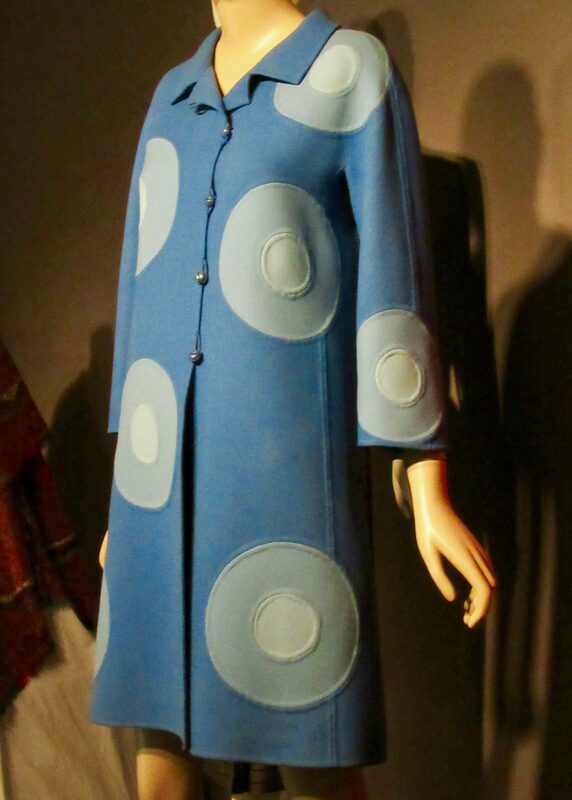 Double-faced wool, used here by designer Mila Schön for her Blue Coat (1968) is woven almost as two separate textiles, joined by a set of interwoven yarns, creating a thick, structural, spongy fabric. 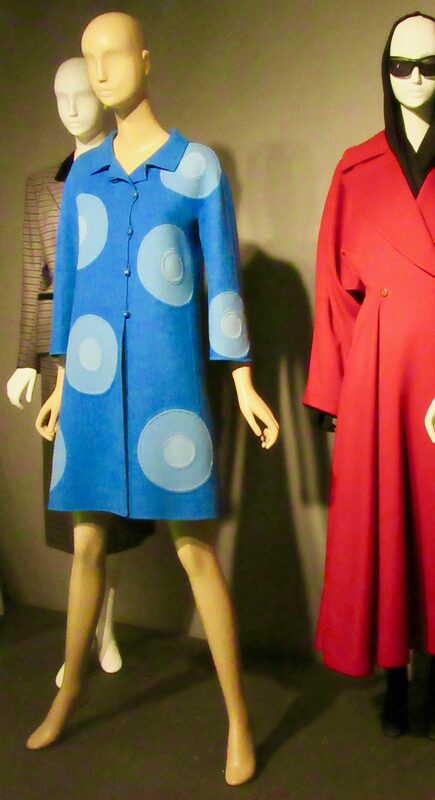 The textile’s density supports this A-line silhouette, while the wool’s pliability eases the inset of Pop Art circles. 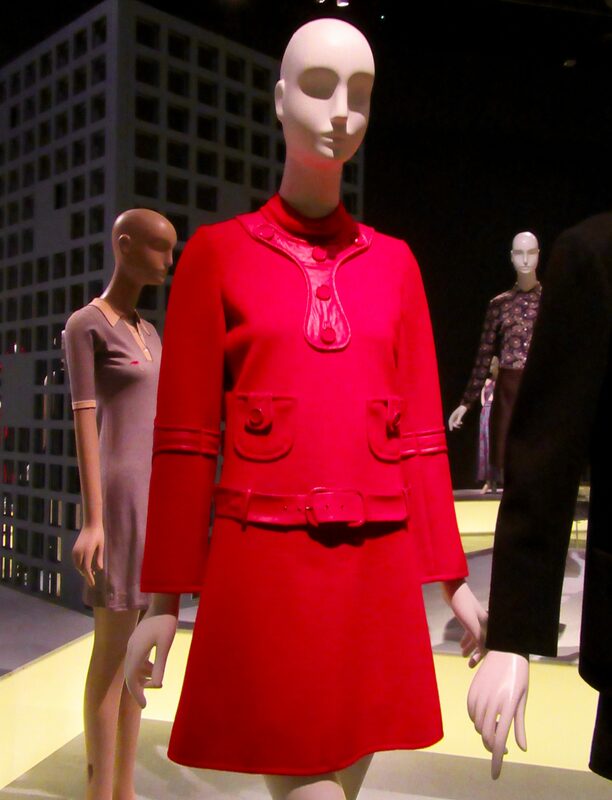 The hems were self-finished by opening the layers and stitching the edges to the inside. 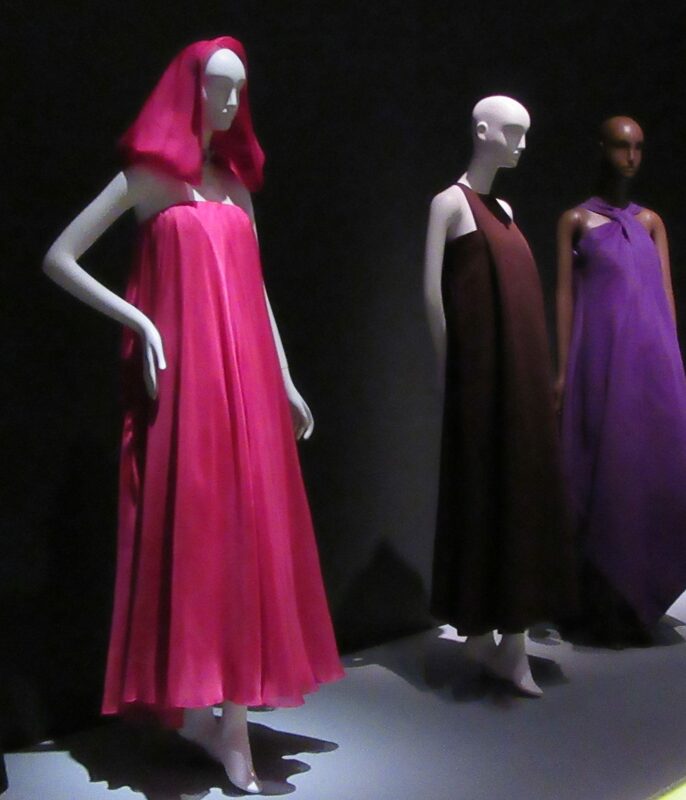 Photographed as Part of the Exhibit, Fabric in Fashion, on View Through May 4th, 2019 at The Museum at FIT in Manhattan. 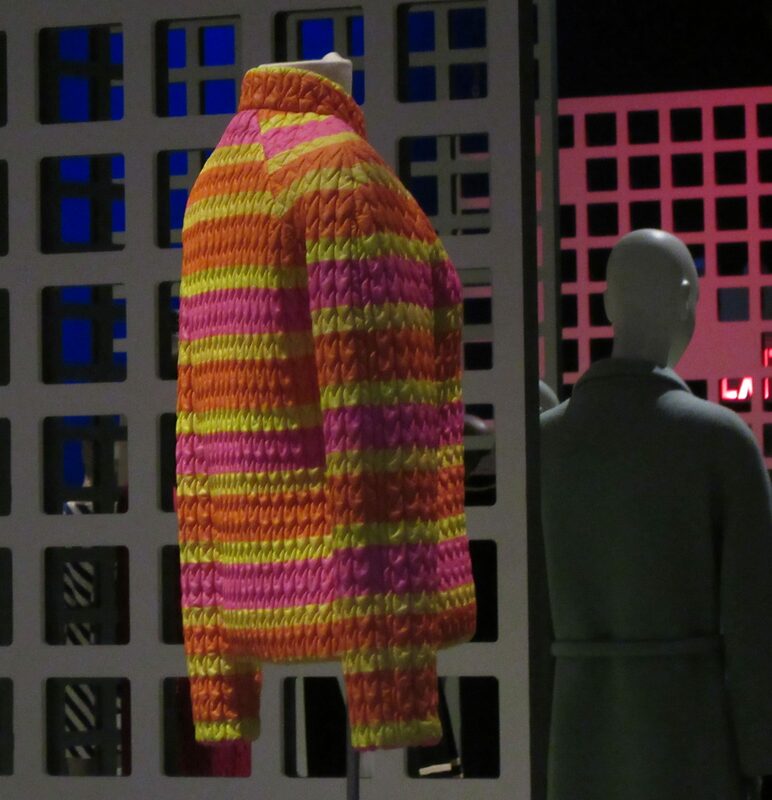 A few weeks ago, we went over to The Fashion Institute of Technology to check out the 2017 MFA in Illustration Visual Thesis Exhibition, which was entitled 13 Stories. 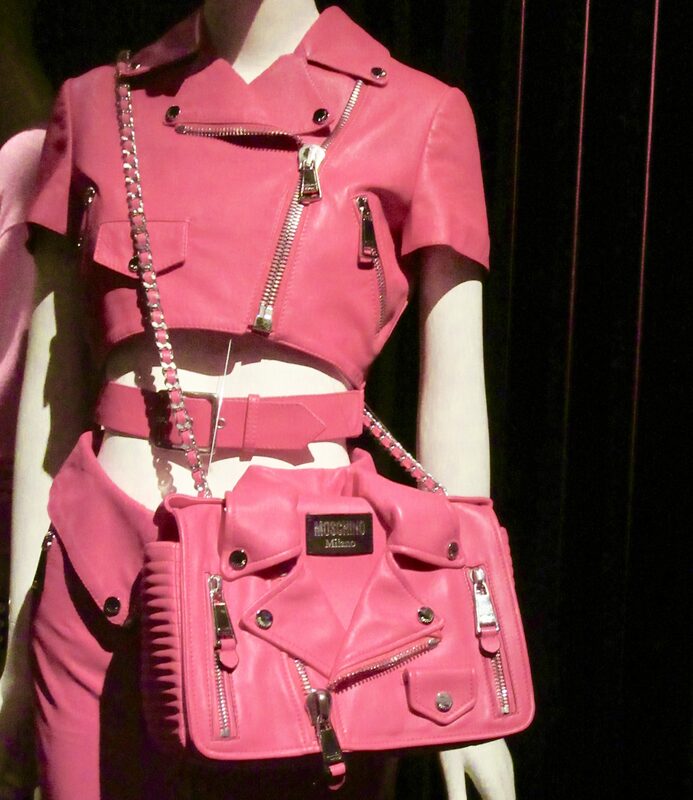 It is while visiting the exhibit that I discovered a cool Pink Thing created by FIT student and MFA candidate Necdet Yilmaz, who is a native of Turkey. 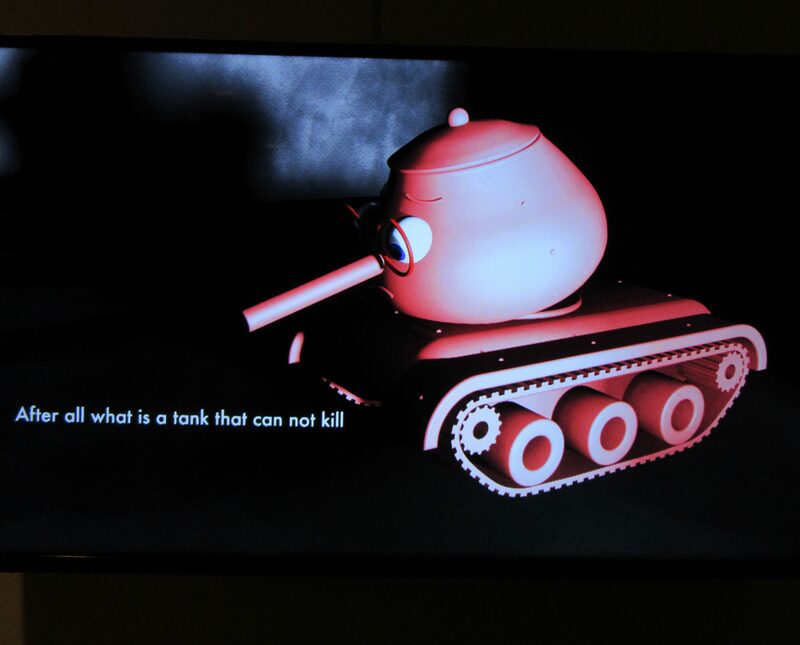 Necdet’s visual thesis, Happy Tank, is a story about a little machine built for war that doesn’t want to fight. 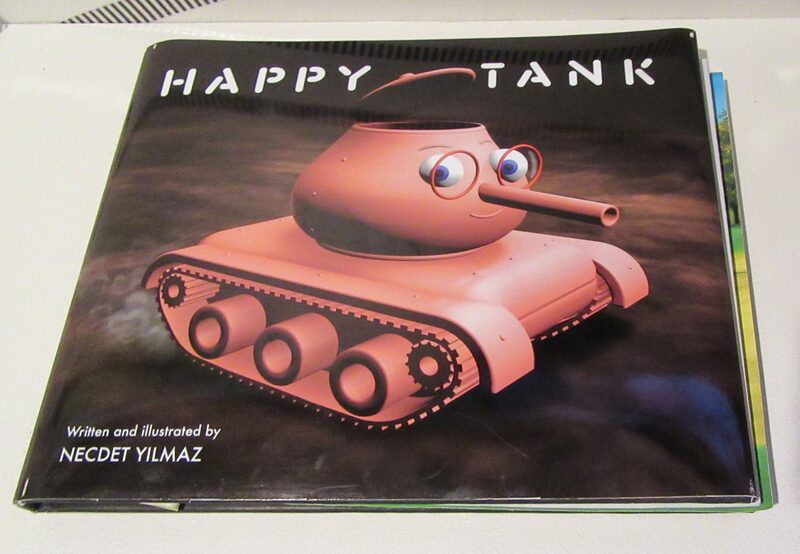 Happy Tank must be sent to war, but refuses to fire at a large building where a child is seen crying. 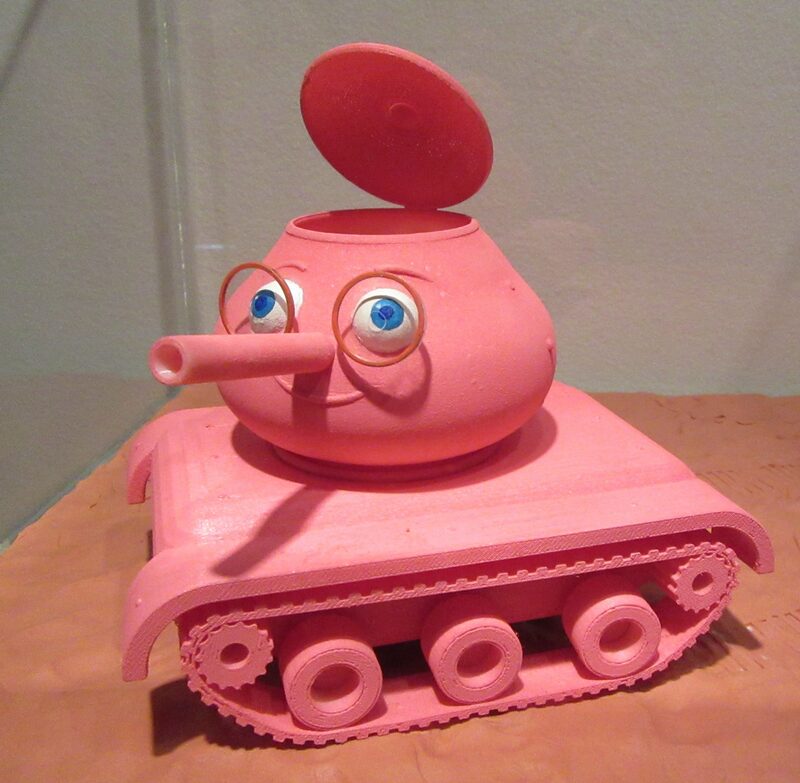 For disobeying the order, Happy Tank is decommissioned and melted down. 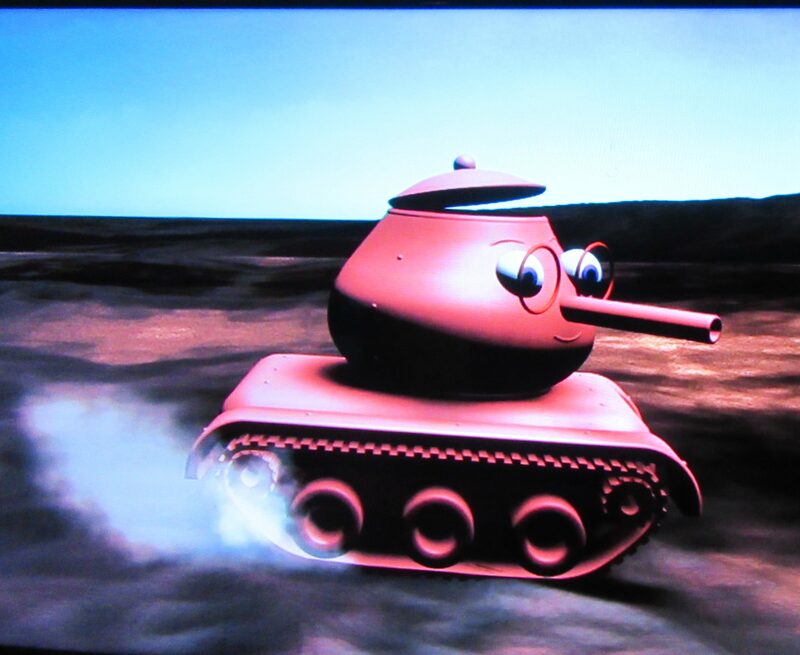 The story concludes with Happy Tank being recycled and used to construct a playground years after the war is over. Necdet explains that this project “is related to my written thesis, War Themed Childrn’s Books and Propaganda. 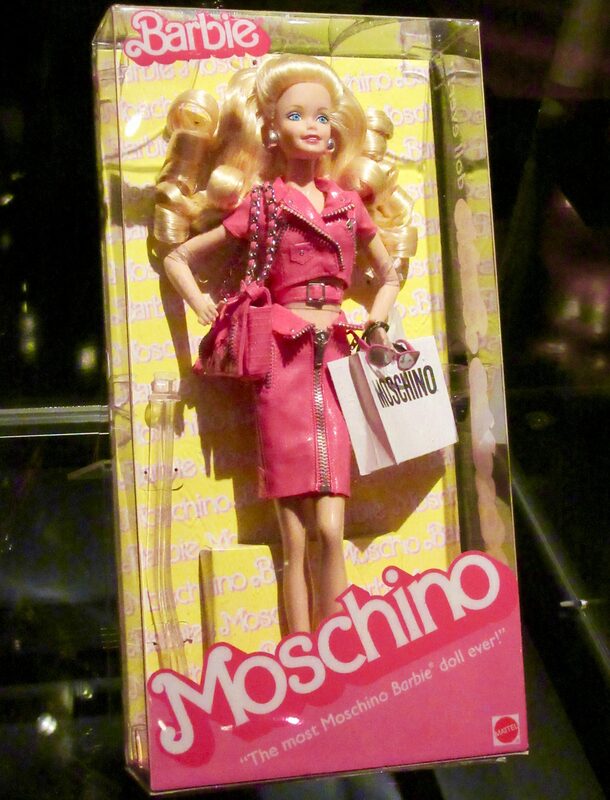 In wars, children are often affected and exploited as a propaganda tool. 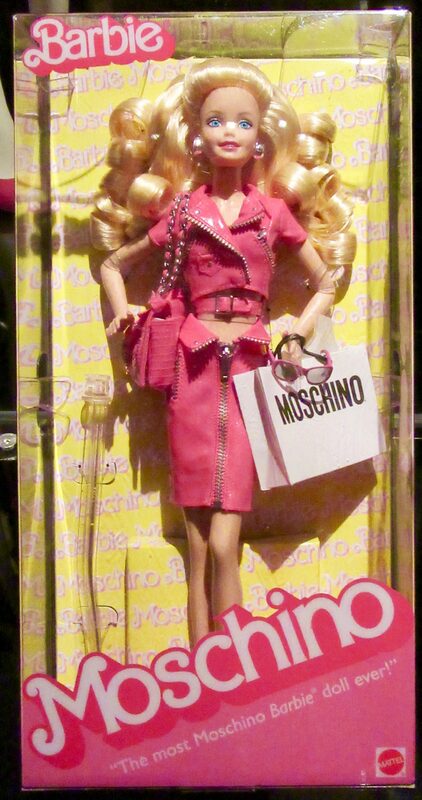 However, my project is in opposition to what I researched in my thesis. 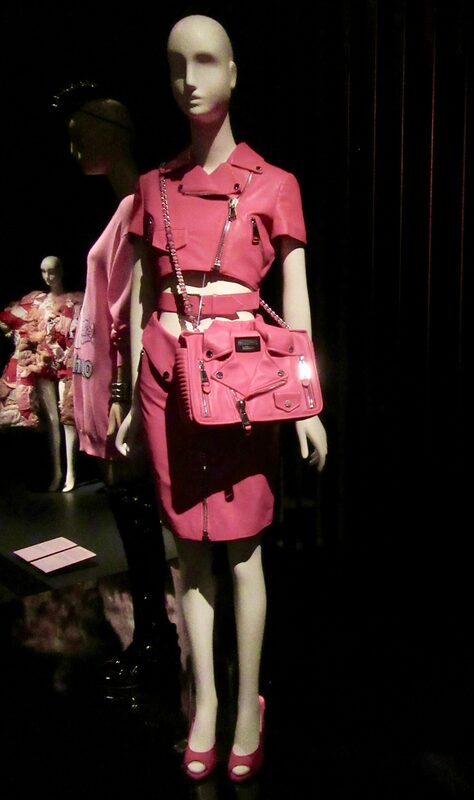 Personally, I am inspired to create these piece because of my background. My home country, Turkey, is located near the Middle East where there is constant war. This instability affects people in the region, like myself, economically, socially and psychologically. 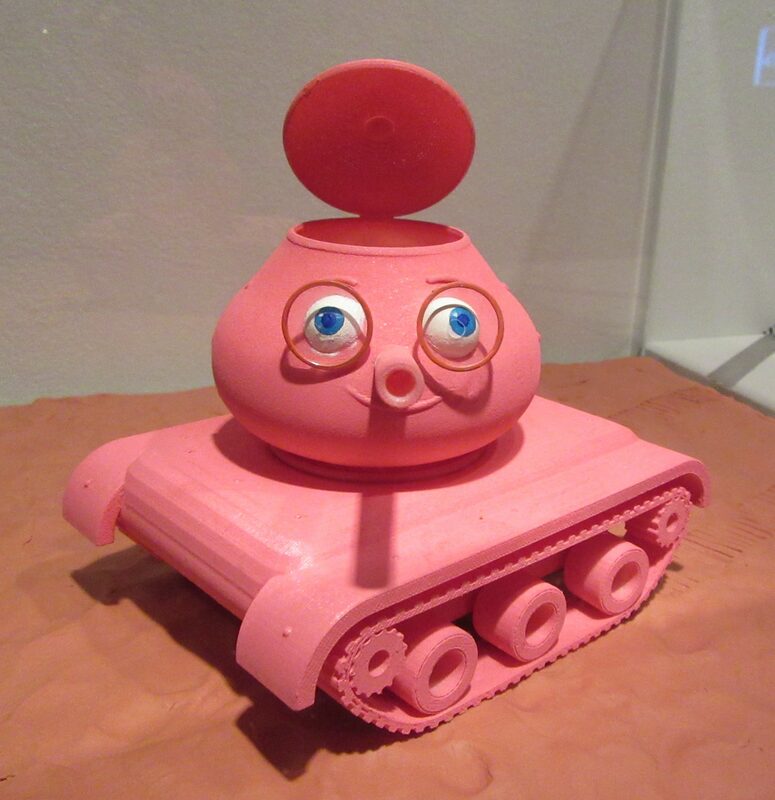 Given our political climate today, Happy Tank could be considered more relevant now than ever. 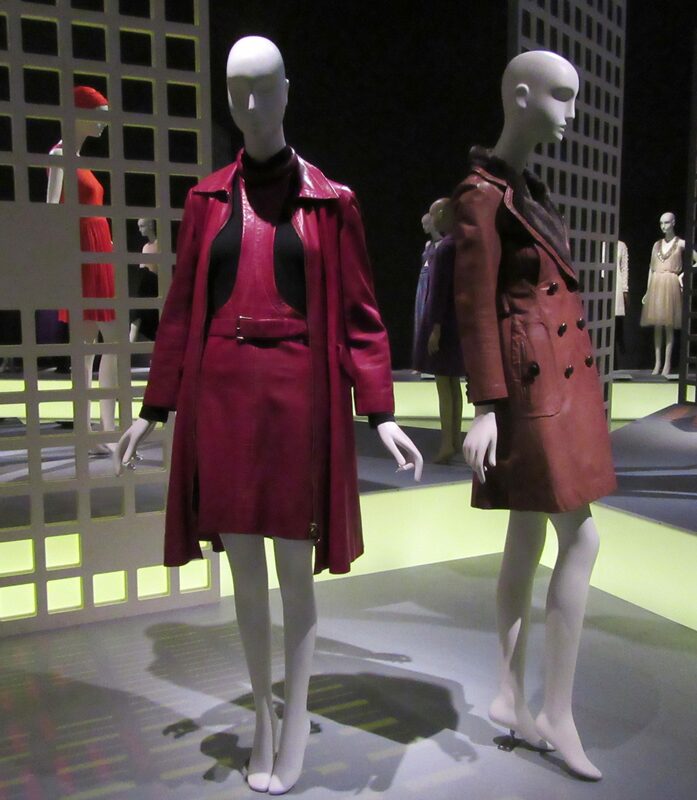 You can see more projects by Necdet at his website, located at This Link. 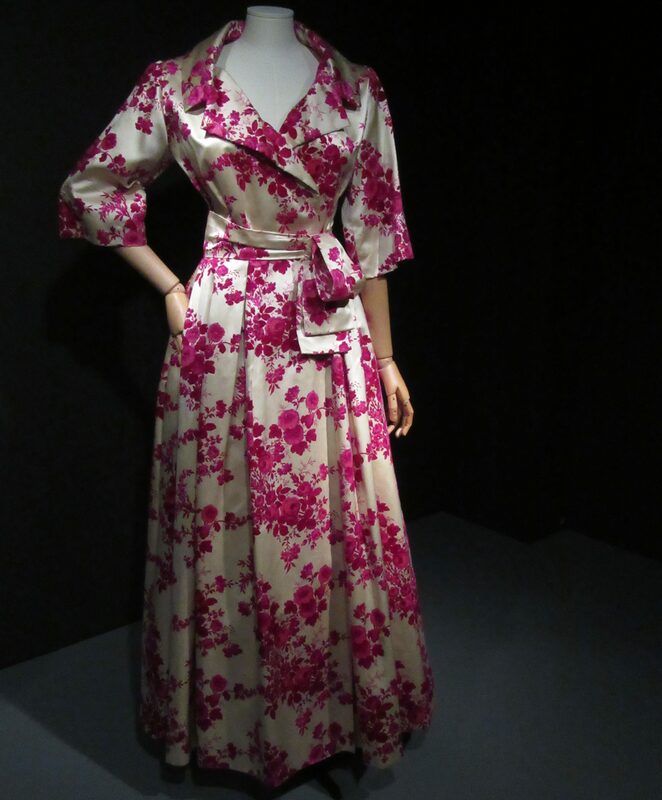 Photographed in the Museum at FIT, Located on Seventh Avenue at 27th Street, as Part of the 13 Stories Exhibit, which is now Closed. 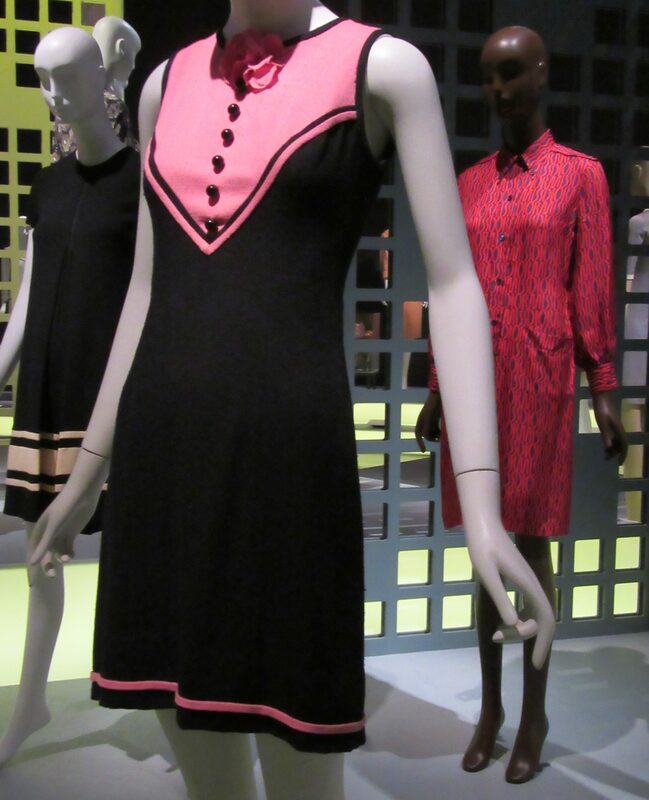 French fashion journalist and designer Michèle Rosier (1930-2017), the daughter of Elle Magazine editor Hélène Gordon-Lazareff, ran her own popular ready-to-wear label, V de V was short for Vêtements de Vacance or Vacation Clothes. 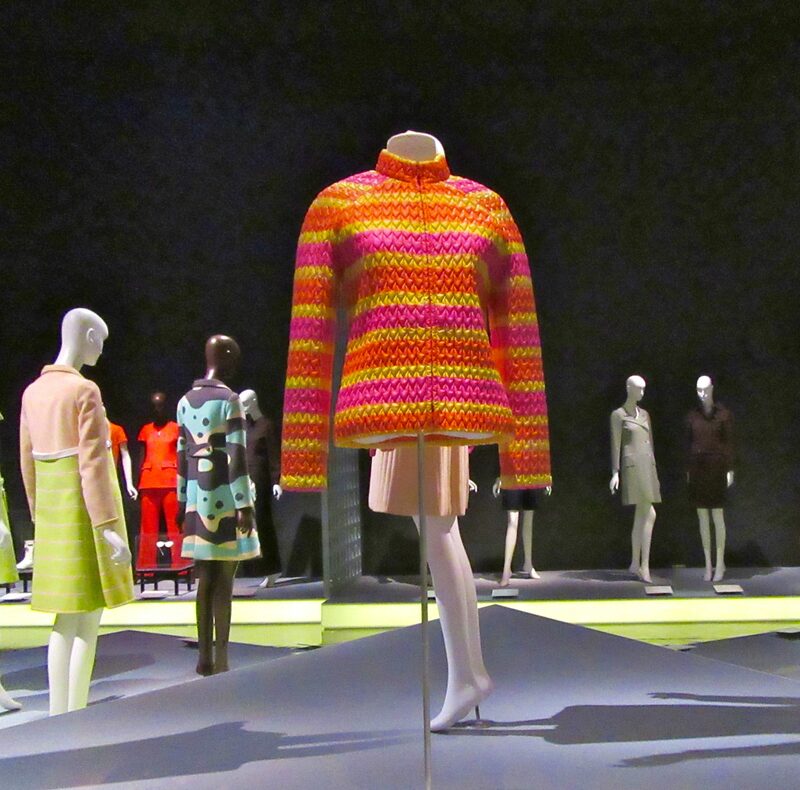 Photographed at the Exhibit Paris Refashioned: 1957-1968, Which Closed at the Museum at FIT on April 15th, 2017. 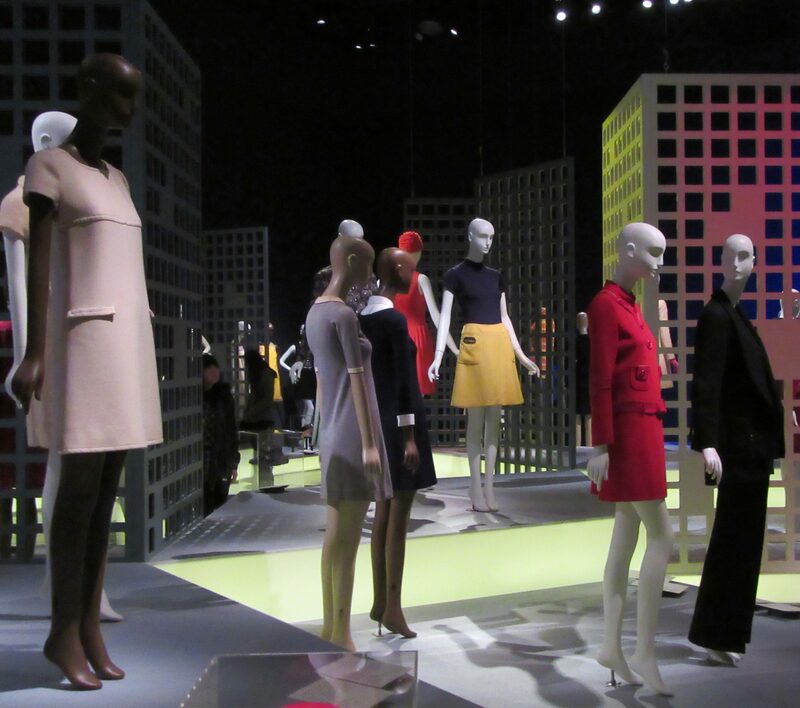 For reasons that take too long to talk about, I’m late to the game with my post on the exhibit Paris Refashioned: 1957-1968, which closed on April 15th, 2017. 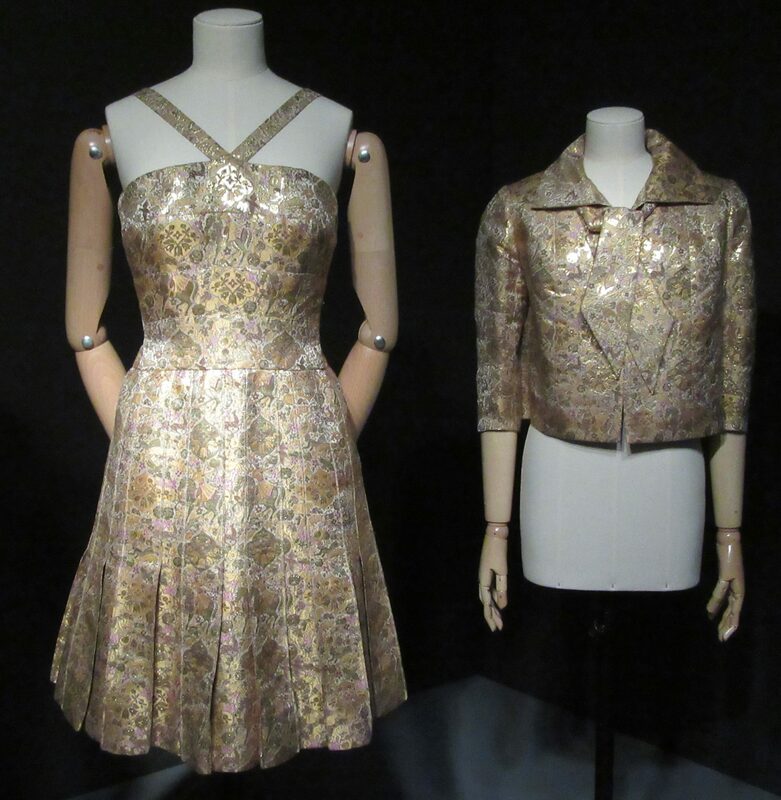 But why waste a collection of lovely photos when I could still post them here, in hope that they will entice you to attend the museum’s next exhibit, while you learn more about the history of French fashion! 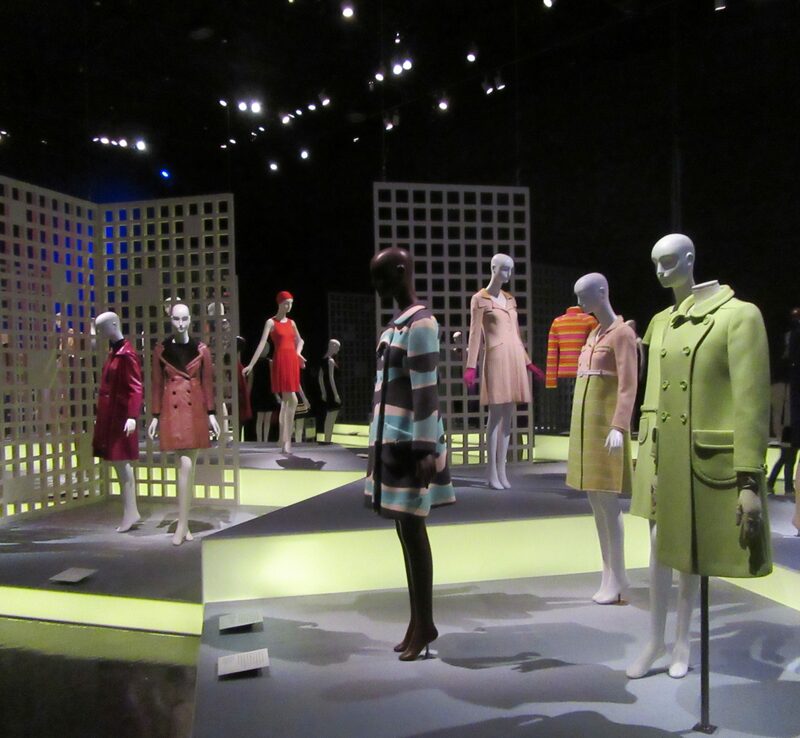 I was fortunate to visit the exhibit one frigid Saturday afternoon in February, when there were very few other attendees and the feelings of nostalgia were great, as it reminded me of shopping with my mother when I was a little girl back in the 1960s. 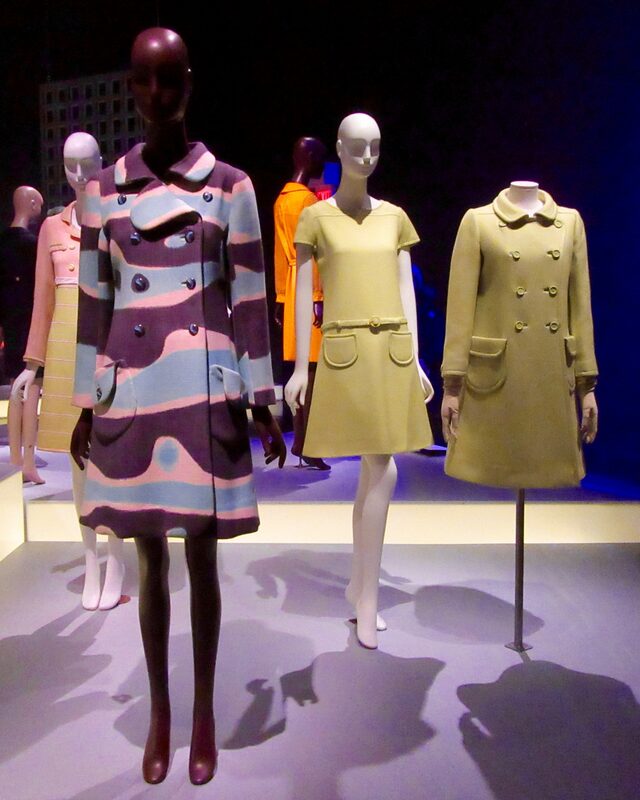 Paris Refashioned, 1957-1968 highlighted one of the most groundbreaking time periods in fashion history. 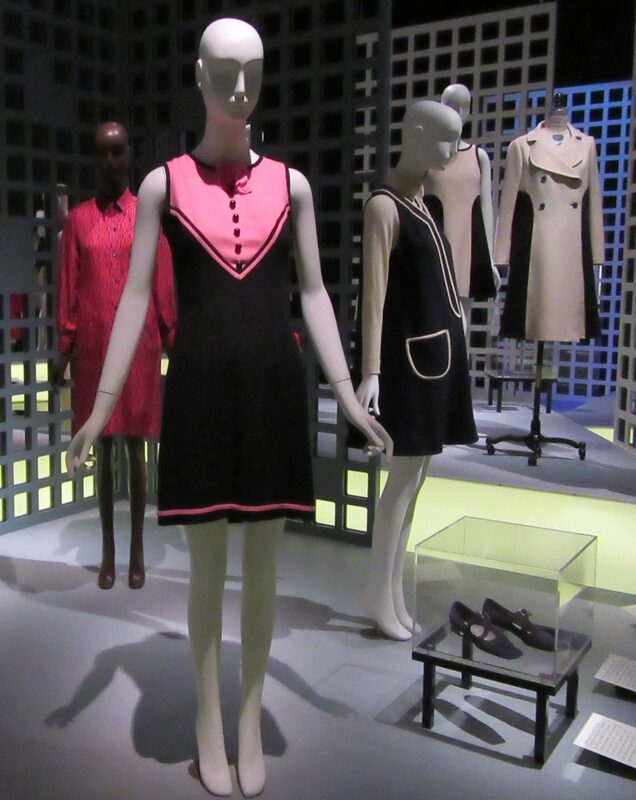 While many books and exhibitions about this era position London as the center of innovative, youth-oriented design, this limited perspective overlooks the significant role that Paris continued to play in the fashion industry. 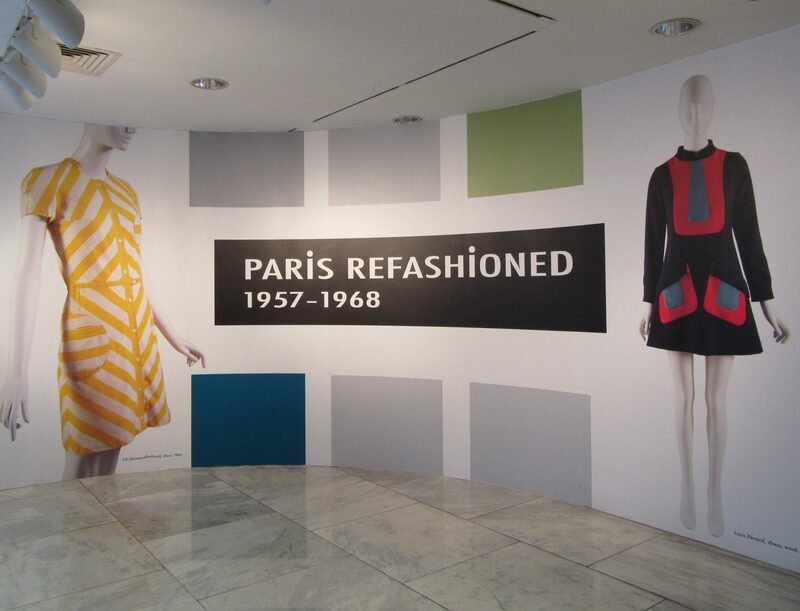 Paris Refashioned, 1957-1968 examined the combined influence of French haute couture, ready-to-wear, and popular culture during this era, with particular emphasis on how fashion was perceived and promoted by the American fashion press. 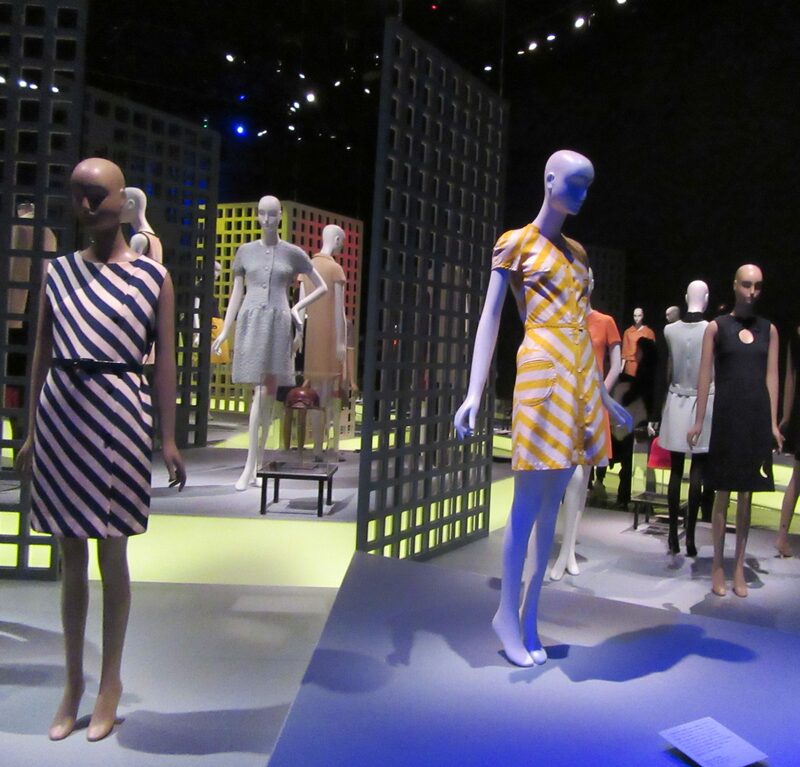 All objects on view were selected from The Museum at FIT’s permanent collection of more than 50,000 objects. 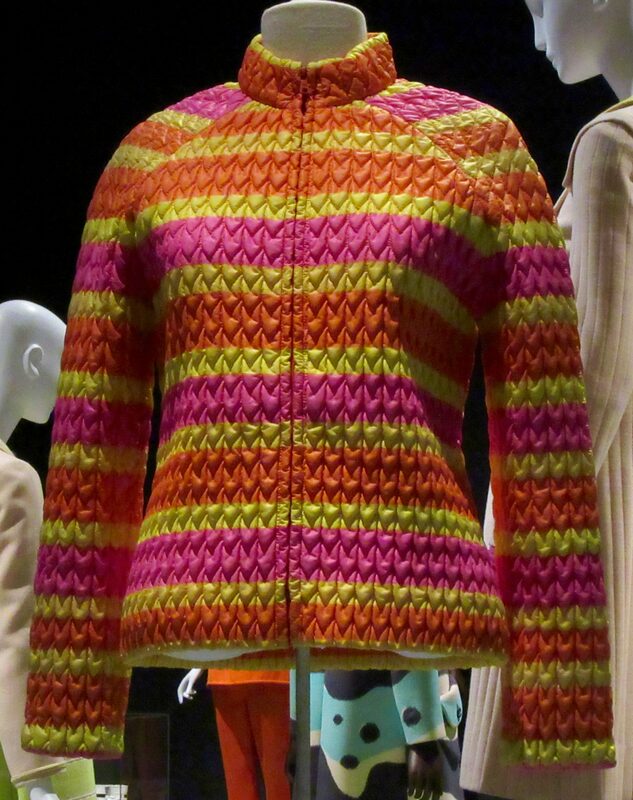 Please enjoy some of our favorite designs from the show! 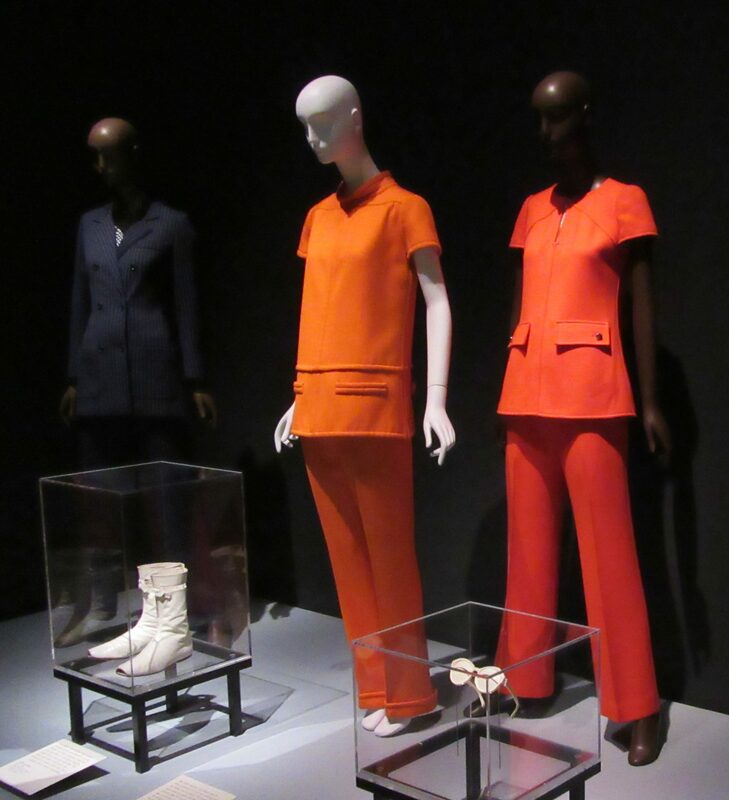 Look for more individual pieces from the exhibit to be featured in Wednesday’s weekly Eye On Design column in upcoming weeks!